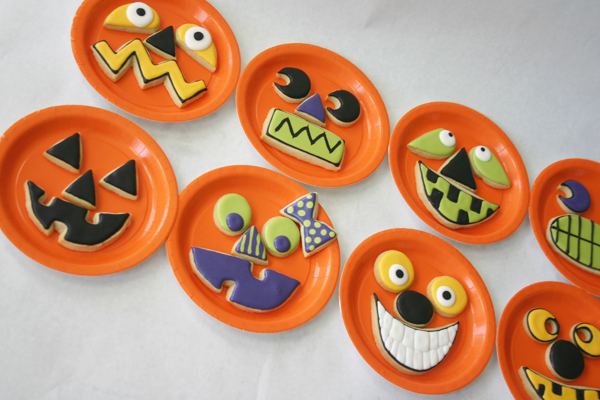 Forget using paper to make paper plate jack-o-lanterns! These fun cookie jack-o-lanterns from Bee In Our Bonnet are ten times more fun! Just put some jack-o-lantern pieces in a jar and you have a great Halloween party favor or neighbor gift. And how fun would these be for a school Halloween party? Ashleigh was part of the fun Halloween ideas being shared by guest over at Eighteen25, where you can check out the jack-o-lantern in a jar tutorial. And you can check out other jack-o-lantern fun in our archives. CLick on the link that says jack-o-lantern in a jar tutorial or the link that says cookie jack-o-lanterns.